This article is about names for the monotheist belief of a singular God. For theonyms generally, see List of deities. 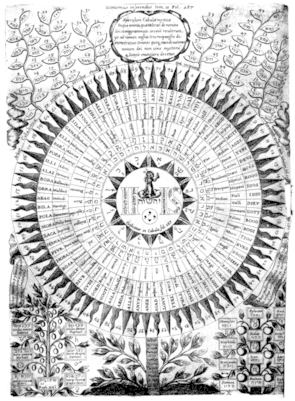 A diagram of the names of God in Athanasius Kircher's Oedipus Aegyptiacus (1652–54). The style and form are typical of the mystical tradition, as early theologians began to fuse emerging pre-Enlightenment concepts of classification and organization with religion and alchemy, to shape an artful and perhaps more conceptual view of God. A number of traditions have lists of many names of God, many of which enumerate the various qualities of a Supreme Being. The English word "God" is used by multiple religions as a noun or name to refer to different deities. Ancient cognate equivalents for the word "God" include proto-Semitic El, biblical Hebrew Elohim, Arabic 'ilah, and biblical Aramaic Elah. The personal or proper name for God in many of these languages may either be distinguished from such attributes, or homonymic. For example, in Judaism the tetragrammaton is sometimes related to the ancient Hebrew ehyeh (I will be). Correlation between various theories and interpretation of the name of "the one God", used to signify a monotheistic or ultimate Supreme Being from which all other divine attributes derive, has been a subject of ecumenical discourse between Eastern and Western scholars for over two centuries. In Christian theology the word must be a personal and a proper name of God; hence it cannot be dismissed as mere metaphor. On the other hand, the names of God in a different tradition are sometimes referred to by symbols. The question whether divine names used by different religions are equivalent has been raised and analyzed. Exchange of names held sacred between different religious traditions is typically limited. Other elements of religious practice may be shared, especially when communities of different faiths are living in close proximity (for example, the use of Om and Gayatri within the Indian Christian community) but usage of the names themselves mostly remain within the domain of a particular religion, or even may help define one's religious belief according to practice, as in the case of the recitation of names of God (such as the japa). Guru Gobind Singh's Jaap Sahib, which contains 950 names of God. The Divine Names, the classic treatise by Pseudo-Dionysius, defines the scope of traditional understandings in Western traditions such as Hellenic, Christian, Jewish and Islamic theology on the nature and significance of the names of God. Further historical lists such as The 72 Names of the Lord show parallels in the history and interpretation of the name of God amongst Kabbalah, Christianity, and Hebrew scholarship in various parts of the Mediterranean world. The attitude as to the transmission of the name in many cultures was surrounded by secrecy. In Judaism, the pronunciation of the name of God has always been guarded with great care. It is believed that, in ancient times, the sages communicated the pronunciation only once every seven years; this system was challenged by more recent movements. The nature of a holy name can be described as either personal or attributive. In many cultures it is often difficult to distinguish between the personal and the attributive names of God, the two divisions necessarily shading into each other. El comes from a root word meaning might, strength, power. Sometimes referring to God and sometimes the mighty when used to refer to the God of Israel, El is almost always qualified by additional words that further define the meaning that distinguishes him from false gods. A common title of God in the Hebrew Bible is Elohim (Hebrew: אלהים). The root Eloah (אלה) is used in poetry and late prose (e.g., the Book of Job) and ending with the masculine plural suffix "-im" ים creating a word like ba`alim ("owner(s)" and adonim ("lord(s), master(s)") that may also indicate a singular identity. In the Book of Exodus, God commands Moses to tell the people that 'I AM' sent him, and this is revered as one of the most important names of God according to Mosaic tradition. Moses said to God, “Suppose I go to the Israelites and say to them, ‘The God of your fathers has sent me to you,’ and they ask me, ‘What is his name?’ Then what shall I tell them?” God said to Moses, “I am who I am. This is what you are to say to the Israelites: ‘I am has sent me to you.'" God also said to Moses, “Say to the Israelites, ‘The Lord, the God of your fathers—the God of Abraham, the God of Isaac and the God of Jacob—has sent me to you.’ This is my name forever, the name you shall call me from generation to generation". In Exodus 6:3, when Moses first spoke with God, God said, "I used to appear to Abraham, Isaac, and Jacob as El Shaddai, but I did not make myself known to them by my name YHWH." YHWH (יהוה‎) is the proper name of God in Judaism. Neither vowels nor vowel points were used in ancient Hebrew writings and the original vocalisation of YHWH had been lost. Later commentaries additionally suggested that the true pronunciation of this name is composed entirely of vowels, such as the Greek Ιαουε. However, this is put into question by the fact that vowels were only distinguished in the time-period by their very absence due to the lack of explicit vowels in the Hebrew script. The resulting substitute made from semivowels and glottals, known as the tetragrammaton, is not ordinarily permitted to be pronounced aloud, even in prayer. The prohibition on misuse (not use) of this name is the primary subject of the command not to take the name of the Lord in vain. Instead of pronouncing YHWH during prayer, Jews say "Adonai" ("Lord"). Halakha requires that secondary rules be placed around the primary law, to reduce the chance that the main law will be broken. As such, it is common religious practice to restrict the use of the word "Adonai" to prayer only. In conversation, many Jewish people, even when not speaking Hebrew, will call God HaShem (השם), which is Hebrew for "the Name" (this appears in Leviticus 24:11). Almost all Orthodox Jews avoid using either Yahweh or Jehovah altogether on the basis that the actual pronunciation of the tetragrammaton has been lost in antiquity. Many use the term HaShem as a euphemism, or they use "God" or "The Lord" instead. Early Christian writers, such as Clement of Alexandria in the 2nd century, had used a form like Yahweh, and claim that this pronunciation of the tetragrammaton was never really lost. Other Greek transcriptions also indicated that YHWH should be pronounced Yahweh. The Hebrew theonyms Elohim and YHWH are mostly rendered as "God" and "the LORD" respectively, although in the Protestant tradition the personal names Yahweh and Jehovah are also used. "Jehovah" appears in the Tyndale Bible, the King James Version, and other translations from that time period and later. Many translations of the Bible translate the tetragrammaton as LORD, following the Jewish practice of substituting Adonai for YHWH when read aloud. English Bible translations of the Greek New Testament render ho theos (Greek: Ο Θεός) as God and ho kurios (Greek: Ο Κύριος) as "the Lord". Jesus (Iesus, Yeshua was a common alternative form of the name יְהוֹשֻׁעַ ("Yehoshua" - Joshua) in later books of the Hebrew Bible and among Jews of the Second Temple period. The name corresponds to the Greek spelling Iesous, from which comes the English spelling Jesus. "Christ" means "the anointed" in Greek (Χριστός). Khristos is the Greek equivalent of the Hebrew word Messiah; while in English the old Anglo-Saxon Messiah-rendering hæland (healer) was practically annihilated by the Latin "Christ", some cognates such as heiland in Dutch and Afrikaans survive—also, in German, the word Heiland is sometimes used as reference to Jesus, e.g., in church chorals). In Messianic Judaism YHWH (pre-incarnate) and Yeshua (incarnate) are one and the same, the second Person, with the Father and ruach hakodesh (Holy Spirit) being the first and third Persons, respectively, of ha'Elohiym (the Godhead). YHWH is called haShem. Some Quakers refer to God as The Light. Another term used is King of Kings or Lord of Lords and Lord of the Hosts. Other names used by Christians include Ancient of Days, Father/Abba, "Most High" and the Hebrew names Elohim, El-Shaddai, Yahweh, Jehovah and Adonai. Abba (Father) is a common term used for the creator within Christianity because it was a title Jesus used to refer to God the Father. In Mormonism the name of God the Father is Elohim  and the name of Jesus in his pre-incarnate state was Jehovah. Together, with the Holy Ghost they form the Godhead; God the Father, Jesus Christ, and the Holy Spirit. Mormons typically refer to God as "Heavenly Father" or "Father in Heaven". Although Mormonism views the Father, the Son, and the Holy Spirit as three distinct beings, they are one in purpose and God the Father (Elohim) is worshiped and given all glory through his Son, Jesus Christ (Jehovah). Despite the Godhead doctrine, which teaches that God the Father, Jesus Christ and the Holy Ghost are three separate, divine beings, many Mormons (mainstream Latter-day Saints and otherwise, such as the Fundamentalist Church of Jesus Christ of Latter-Day Saints) view their beliefs as monotheist since Christ is the conduit through which humanity comes to the God the Father. The Book of Mormon ends with "to meet you before the pleasing bar of the great Jehovah, the eternal Judge of both the quick and dead. Amen." Jehovah's Witnesses believe that God has only one distinctive name, represented in the Old Testament by the tetragrammaton. In English, they prefer to use the form Jehovah. According to Jehovah's Witnesses, the name Jehovah means "He causes to become". Scriptures frequently cited in support of the name include Isaiah 42:8: "I am Jehovah. That is my name", Psalms 83:18: "May people know that you, whose name is Jehovah, You alone are the Most High over all the earth", and Exodus 6:3: "And I used to appear to Abraham, Isaac, and Jacob as God Almighty, but with regard to my name Jehovah I did not make myself known to them." Shàngdì (上帝 pinyin shàng dì, literally 'King Above') is used to refer to the Christian God in the Standard Chinese Union Version of the Bible. Shén 神 (lit. "God", "spirit", or "deity") was adopted by Protestant missionaries in China to refer to the Christian God. In this context it is usually rendered with a space, " 神", to demonstrate reverence. Zhŭ and Tiānzhǔ 主,天主 (lit. "Lord" or "Lord in Heaven") are equivalent to "Lord"; these names are used as formal titles of the Christian God in Mainland China's Christian churches. Korean Catholics also use the Korean cognate of Tiānzhŭ, Cheon-ju, as the primary reference to God in both ritual/ceremonial and vernacular (but mostly ritual/ceremonial) contexts. Korean Catholics and Korean Anglicans also use a cognate of the Chinese Shàngdì (Sangje), but this has largely fallen out of regular use in favor of Cheon-ju. Also used is the vernacular Haneunim, the traditional Korean name for the God of Heaven. Liberal-minded Korean Protestants also use Haneunim, but not Sangje, and conservative Korean Protestants do not use Sangje or Haneunim at all but instead use Hananim, which implied the oneness of the Almighty distinct from the mythological implications they see in the term Haneunim. Many Vietnamese Christians also use cognates of Shàngdì (expected to have a distribution in usage similar to Korean Christians, with Anglicans and Catholics using the cognates of Sangje in ritual/ceremonial contexts and Protestants not using it at all), to refer to the biblical God. Tagalog-speaking Filipino Catholics and other Christians use Maykapal (glossed as "creator") – an epithet originally applied to the pre-colonial supreme deity Bathala – to refer to the Christian godhead in most contexts. When paired with another term for God (e.g. Panginoong Maykapal "Lord Creator", Amang Maykapal "Father Creator"), it functions as a descriptor much like the adjectives in the English "God Almighty" or Latin Omnipotens Deus. Among the Nguni peoples of Southern Africa, he is known as Nkosi (roughly glossed as "king"). This name is used in Nkosi Sikelel' iAfrika. Followers of the Rastafari Movement call God Jah Rastafari. In the Yorubaland region of West Africa, meanwhile, he is known as Olodumare. 99 names of Allah, in Chinese Sini (script). Allah—meaning "the God", or "the Deity"—is the most frequently used name of God in Islam. God has many names in Islam, the Qur'an says (translation) to Him Belong the Best Names (Lahu Al-Asmao Al-Husna), examples like Ar-Rahman (The Entirely Merciful), Ar-Rahim (The Especially Merciful). Besides these Arabic names, Muslims of non-Arab origins may also sometimes use other names in their own languages to refer to God, such as Khuda in both Persian language and Urdu. The Bahá'í scriptures often refer to God by various titles and attributes, such as Almighty, All-Possessing, All-Powerful, All-Wise, Incomparable, Gracious, Helper, All-Glorious, and Omniscient. Bahá'ís believe the greatest of all the names of God is "All-Glorious" or Bahá in Arabic. Bahá is the root word of the following names and phrases: the greeting Alláh-u-Abhá (God is the All-Glorious), the invocation Yá Bahá'u'l-Abhá (O Thou Glory of the Most Glorious), Bahá'u'lláh (The Glory of God), and Bahá'i (Follower of the All-Glorious). These are expressed in Arabic regardless of the language in use (see Bahá'í symbols). Apart from these names, God is addressed in the local language, for example Ishwar in Hindi, Dieu in French and Dios in Spanish. Bahá'ís believe Bahá'u'lláh, the founder of the Bahá'í Faith, is the "complete incarnation of the names and attributes of God". Krishna, कृष्ण Krishna is recognised as the complete and or as the Supreme God in his own right. Krishna is one of the most widely revered and popular of all Hindu deities. Bhagavan, भगवान the most frequently used name for God in Hinduism. Brahman,ब्रह्मण the unchanging reality amidst and beyond the world, which cannot be exactly defined. Ishvara इश्वर is a theological concept in Hinduism translating to "lord," applied to the "Supreme Being" or God in the monotheistic sense, or as an Ishta-deva in monistic thought. Brahma, ब्रम्ह is the Hindu god of creation and one of the Trimurti. Vishnu विष्णू is the Supreme God of Vaishnavism, one of the three main sects of Hinduism. The Mahabharata, (Anusasana Parva) book 13, (S-149) lists the thousand names of the one god (Vasudeva). "that man who hears the names every day or who recites them every day, with devotion, never meets with any evil either here or hereafter." Maharishi Dayanand in his famous book Satyarth Prakash has listed 100 names of God each representing some property or attribute thereof mentioning “Om or Aum” as God’s personal and natural name. Jainism rejects the idea of a creator deity responsible for the manifestation, creation, or maintenance of this universe. According to Jain doctrine, the universe and its constituents (soul, matter, space, time, and principles of motion) have always existed. All the constituents and actions are governed by universal natural laws and an immaterial entity like God cannot create a material entity like the universe. Jainism offers an elaborate cosmology, including heavenly beings (devas), but these beings are not viewed as creators; they are subject to suffering and change like all other living beings, and must eventually die. Jains define godliness as the inherent quality of any soul characterizing infinite bliss, infinite power, Perfect knowledge and Perfect peace. However, these qualities of a soul are subdued due to karmas of the soul. One who achieves this state of soul through right belief, right knowledge and right conduct can be termed as god. This perfection of soul is called Kaivalya or Bodhi. A god thus becomes a liberated soul – liberated of miseries, cycles of rebirth, world, karmas and finally liberated of body as well. This is called nirvana or moksha. If godliness is defined as the state of having freed one's soul from karmas and the attainment of enlightenment/Nirvana and a god as one who exists in such a state, then those who have achieved such a state can be termed gods/Tirthankara. Thus, Rishabha was god/Tirthankara but he was not the only Tirthankara; there were many other Tirthankara. However, the quality of godliness is one and the same in all of them. Thus, Jainism can be defined as polytheist, monotheist, nontheist, transtheist or atheist, depending on one's definition of God. Jainism does not teach the dependency on any supreme being for enlightenment. The Tirthankara is a guide and teacher who points the way to enlightenment, but the struggle for enlightenment is one's own. Moral rewards and sufferings are not the work of a divine being, but a result of an innate moral order in the cosmos; a self-regulating mechanism whereby the individual reaps the fruits of his own actions through the workings of the karmas. Jains believe that to attain enlightenment and ultimately liberation from all karmic bonding, one must practice the ethical principles not only in thought, but also in words (speech) and action. Such a practice through lifelong work towards oneself is called as observing the Mahavrata ("Great Vows"). Gods can be thus categorized into embodied gods also known as Tīrthankaras and Arihantas or ordinary Kevalin, and non-embodied formless gods who are called Siddhas. Jainism considers the devīs and devas to be souls who dwell in heavens owing to meritorious deeds in their past lives. These souls are in heavens for a fixed lifespan and even they have to undergo reincarnation as humans to achieve moksa. Akal Purakh, meaning timeless One. Ik Onkar, the beginning of the Sikh Mool Mantra. Satnam meaning True Name, some are of the opinion that this is a name for God in itself, others believe that this is an adjective used to describe the "Gurmantar", Waheguru (See above). Waheguru, meaning Wonderful Teacher bringing light to remove darkness, this name is considered the greatest among Sikhs, and it is known as Gurmantar, the Guru's Word. Waheguru is the only way to meet god in Sikhism. Allah, meaning "The God": The term is also used by Sikhs in the Sikh scriptures in reference to God. The word Allah (ਅਲਹ੝) is used 12 times in the Guru Granth Sahib by Sheikh Farid. Guru Nanak, Guru Arjan and Saint Kabeer used the word 18 times. God, according to Guru Nanak, is beyond full comprehension by humans; has endless number of virtues; takes on innumerable forms, but is formless; and can be called by an infinite number of names thus "Your Names are so many, and Your Forms are endless. No one can tell how many Glorious Virtues You have." In Zoroastrianism, 101 names of God (Pazand Sad-o-yak nam-i-khoda) is a list of names of God (Ahura Mazda). The list is preserved in Persian, Pazand and Gujarati. Parsi tradition expanded this to a list of "101 names of God". ↑ Velde, Rudi van de (2006). Aquinas on God: the 'divine science' of the Summa theologiae. Aldershot, Hants, England: Ashgate. pp. 45–46. ISBN 0-7546-0755-0. ↑ Singh, Prithi Pal (2006). The History of Sikh Gurus. Lotus Press. p. 176. ISBN 9788183820752. 1 2 "How the Name was originally vocalized is no longer certain. Its pronunciation was in time restricted to the Temple service, then to the High Priest intoning it on the Day of Atonment, after, and after the destruction of the Temple it received a substitute pronunciation both for the reading of Scripture and for its use at prayer." Plaut, W. Gunther; Leviticus / Bernard J. Bamberger ; Essays on ancient Near Eastern literature / commentaries by William W. Hallo (1985). [Torah] = The Torah : a modern commentary (4th ed.). New York: Union of Hebrew Congregations. pp. 424–426. ISBN 0807400556. 1 2 The New Encyclopædia Britannica, Vol. 12, 1998, Chicago, IL, article "Yahweh," p. 804. 1 2 "The Masoretes who vocalized the Hebrew text took the vowels from the word Adonai (יְהֹוָה) and put them with הוה to remind the reader not to pronounce the name but to substitute Adonai (..) A Christian writer of the sixteenth century who was unaware of this substitution transcribed the word as he saw it, namely as Jehovah, and this error has since entered many Christian Bibles . 5. Only rarely has the pronunciation Jehovah been given scholarly endorsement; one exception is J. Neubauer, Bibelwissenschaftliche Irrungen (Berlin: Louis Lamm, 1917), who bases his opinion on Jerusalem Talmud San.. 10:1, describing the controversy between the Rabbanites and the Samaritans over the proniunciation. M. S. Enslin, The Prophet from Nazareth (New York: Schocken, 1968), p. 19, n. 7, calls the vocalization Jehovah an “orthoepic monstrosity.”" Plaut, W. Gunther; Leviticus / Bernard J. Bamberger ; Essays on ancient Near Eastern literature / commentaries by William W. Hallo (1985). [Torah] = The Torah : a modern commentary (4th ed.). New York: Union of Hebrew Congregations. p. 425. ISBN 0807400556. ↑ NASB (1995). "Preface to the New American Standard Bible". New American Standard Bible (Updated Edition). Anaheim, California: Foundation Publications (for the Lockman Foundation). Archived from the original on 2006-12-07. There is yet another name which is particularly assigned to God as His special or proper name, that is, the four letters YHWH (Exodus 3:14 and Isaiah 42:8). This name has not been pronounced by the Jews because of reverence for the great sacredness of the divine name. Therefore, it has been consistently translated LORD. The only exception to this translation of YHWH is when it occurs in immediate proximity to the word Lord, that is, Adonai. In that case it is regularly translated GOD in order to avoid confusion. ↑ Ilan, Tal (2002). Lexicon of Jewish Names in Late Antiquity Part I: Palestine 330 BCE-200 CE (Texte und Studien zum Antiken Judentum 91). Tübingen, Germany: J.C.B. Mohr. p. 129. ↑ Stern, David (1992). Jewish New Testament Commentary. Clarksville, Maryland: Jewish New Testament Publications. pp. 4–5. ↑ Old Testament Institute Manual:Genesis to 2 Samuel—"Who is the God of the Old Testament?" ↑ "Doctrine and Covenants 76:12-24". ↑ The Church of Jesus Christ of Latter-Day Saints. "How can we come to know our Father in Heaven?". ↑ Holden, A. (2002). Cavorting With the Devil: Jehovah's Witnesses Who Abandon Their Faith (PDF). Department of Sociology, Lancaster University, Lancaster LA1 4YL, UK. p. Endnote [i]. Retrieved 2009-06-21. ↑ "Appendix A4". New World Translation of the Holy Scriptures. p. 1735. ↑ Holden, Andrew (2002). Jehovah's Witnesses: Portrait of a Contemporary Religious Movement. Routledge. p. 24. ISBN 0-415-26609-2. ↑ Ringnes, Hege Kristin (2009). Søda, Helje Kringlebotn, ed. Jehovas vitner—en flerfaglig studie (in Norwegian). Oslo: Universitetsforlaget. p. 27. ↑ "[KS] Name used for "god" in Korean language". ↑ Adamson, Hugh C. (2007). Historical dictionary of the Bahá'í Faith. Metuchen, N.J: Scarecrow Press. ISBN 0-8108-5096-6. ↑ Smith, Peter (2000). "greatest name". A concise encyclopedia of the Bahá'í Faith. Oxford: Oneworld Publications. pp. 167–168. ISBN 1-85168-184-1. ↑ McLean, Jack; Lee, Anthony A. (1997). Revisioning the Sacred: New Perspectives on a Baha'i Theology. Kalimat Press. p. 66. ISBN 0-933770-96-0. ↑ "The Mahabharata, Book 13: Anusasana Parva: Section CXLIX". www.sacred-texts.com. Retrieved 2015-10-20. ↑ Antonio Panaino, The lists of names of Ahura Mazdā (Yašt I) and Vayu (Yašt XV), 2002, p. 20. Edward Washburn Hopkins (1918). History of Religions. ISBN 1-4366-7119-1. Wikimedia Commons has media related to Names of God.